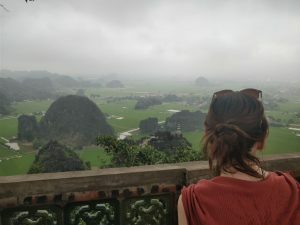 Anyone who follows me on Instagram will know that I just got back from a trip to Vietnam to see a friend and generally get some headspace before getting back into the studio and back on the road in May and June. 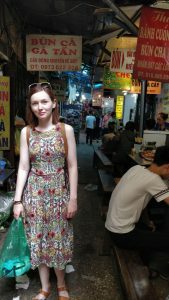 My friend lives in Hanoi, Vietnam, so I made Hanoi my base and from there I (sometimes we) travelled to a few different parts of Vietnam. At first I thought I should resist playing music, because I was worried that it was somehow cheating. That it was somehow work when I was supposed to be not working. That it was somehow a crutch to help me pass the time, and help me be ok with solitude, when I wanted to be able to do those things without help. I wanted to be able to exist peacefully without music. Sometimes I worry that it’s a compulsion rather than a choice. 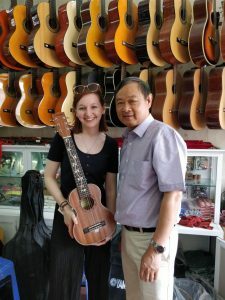 But my friend Millie wanted to sing together, and had suggested before I came out that I buy a guitalele in Hanoi, because it would be cheaper and also small enough to carry around with me on my travels. So we went along to Guitar Street. That’s the way things work in Hanoi; there’s a street for everything. You want a guitar, you go to guitar street. You want a bikini, you go to bikini street. You want a….you get the idea. In about the third or fourth shop we went into, after much miming and pointing and trying to gesticulate the difference between a guitar and a guitalele to several patient Vietnamese men, I found a lovely instrument at about half the price of what it would be going for here in London. Millie works in the evenings, so I was left to myself in her apartment that night. 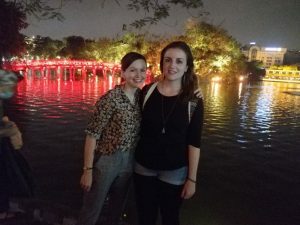 I thought about going out and seeing more of Hanoi; I felt like I should given how much money I’d paid to be there, and how I knew I probably wouldn’t be there again. But I just wanted to play on my new little guitalele. And before I knew it, I’d played and sung for about 4 hours. I felt weirdly confused about it. Like I’d wasted an opportunity. Like I was stupid to spend my time doing exactly what I could have done at home. Plus for me, music has become work, which has gotten bound up with a pressure to achieve, to write ‘the song’, to become the greatest artist I could be. All of that expectation is sitting on my heart every time I sit down to play. And that was pretty much exactly what I wanted to escape by travelling 6,000 miles around the globe. When Millie got home she really didn’t understand what I was giving myself a hard time about. ‘But you enjoy it,’ she said, like it was the simplest thing in the world. I envied her clarity. How had I let it become so complicated? The reason I started playing music in the first place–no, scratch that, because the thing is I never started playing music. It just always was. My family is musical. There were instruments all around the house, always music playing, always singing in the car (yes, we’re that family). There’s a home video of me as a 4 year old prancing around the living room singing and dancing in response to a new cardigan a family friend had knitted for me. Like the moment in a musical when a character becomes so overcome with joy she just has to sing! It was a very cute cardigan to be fair. And I remember one time after a family argument locking myself in the bathroom and singing a Little Mermaid style song about all the precious shampoo bottles I’d collected and arranged on the bath while voices got louder in the other room. Look at this stuff! Isn’t it neat! I must have been 5 or 6. It’s what I’ve always done: expressed myself and whatever I’m feeling through music. It’s my first love. No, that’s not right either. The thing is, it’s not even something outside of myself, which is why I’m struggling to find the words to describe what it means. It just is me. So why did I think travelling half way across the world would mean I could just magically ignore it? Perhaps I’m trying to take a positive from this truth: the things that matter to me, that make me me at home, will not be shaken by a change of place. In a way, this is a difficult truth to accept, because it means that there are aspects of myself that it seems are immovable. And I don’t think we like that idea, because we really want to believe that we are flexible, and malleable, and in control of our own personalities to some extent. If I have to accept this aspect of myself, do I also have to accept that I am grumpy in every country? (yes I do). And I don’t think it’s a fashionable idea, that we have a nature, regardless of nurture. 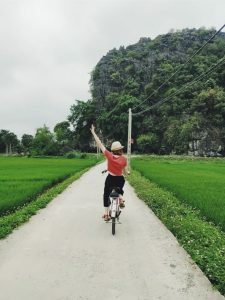 I don’t even know if I believe that myself: honestly I don’t think I’ve done enough travel or really pushed myself enough to know in which ways and to what extent I am able to change. That’s probably a hypothesis I will be testing until my lights are snuffed out. But for now I’m asking a new question: does it make me happy? And if the answer is yes, I’m not going to worry too much about it. That’s where I’m at with this at the moment.Fish gotta swim, birds gotta fly, I gotta sing and play music. I’m accepting it as my nature. Not as a job, or a compulsion, or a pressure. I’m aware that this blog post is markedly lacking in places and dates for one about travel. In a nutshell, I went to cities, beaches, mountains, lakes and rivers, I dived into my solitude, I shared accommodation with a rat more than once, and I lived to tell the tale. So I suppose there’s another lesson there. But the lasting effect of the experience won’t, I think, be the place itself. It will be the ‘stern fact’ that I had to face there. The realisation that music will always be what I do, whether it’s my job or not, and that’s a great gift. I could do with just relaxing into it, and remembering to enjoy it. And my guitalele, unlike my fingers and toes, made it home without a scratch.